NEW YORK (CNN) -- For the fourth year in a row, Iraqis top a growing roster of people seeking asylum in an industrialized nation. They are just ahead of people fleeing wars in Afghanistan and Somalia, said a report published by the U.N. refugee agency Wednesday. 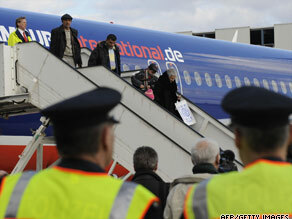 Iraqi refugees leave the plane after arriving at the airport in Hanover, northern Germany, on March 19, 2009. The refugee agency said 13,200 Iraqis applied for asylum. An additional 12,000 claims were from Afghans and 11,000 from Somalis. In all, the United Nations said 185,000 people filed for asylum in the first six months of 2009, a 10 percent increase over last year. Those people were fleeing homelands that also included China, Serbia (including Kosovo), Russia, Nigeria, Mexico, Zimbabwe, Pakistan and Sri Lanka. The United States received the most asylum applications -- 23,700, or 13 percent -- while 38 European nations received 75 percent of the applications. "These statistics show that ongoing violence and instability in some parts of the world force increasing numbers of people to flee and seek protection in safe countries," said Antonio Guterres, the U.N. high commissioner for refugees. "There is an acute need for countries to keep their asylum doors wide open to those who are in genuine need of international protection," he said.